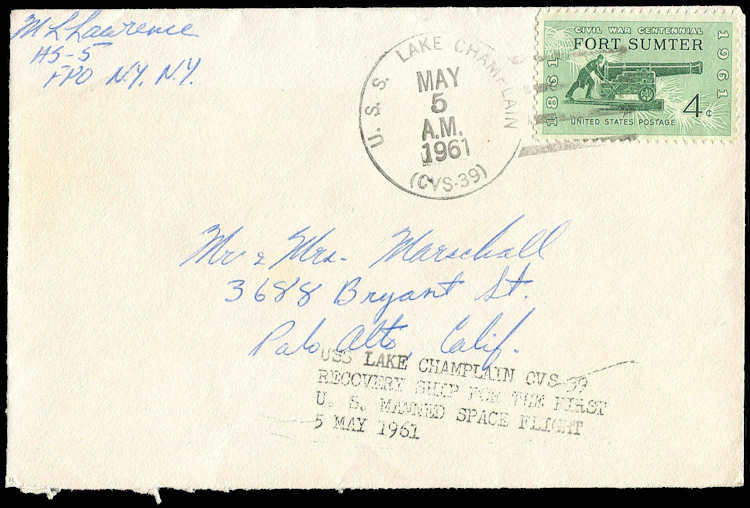 A very rare MR-3 USS Lake Champlain cover from a crew member up for auction. See here for the full story. largest independent astrophilatelic society in the world. The Space Unit was founded in November, 1957 by a group of collectors in the Greater Chicagoland area and midwestern United States. It is incorporated as a non-profit organization in the State of Illinois. Since its inception, it has grown in membership into the largest astrophilatelic independent society in the world. Members are represented throughout the United States and Canada, as well as the five continents.The Space Unit is affiliated with the American Philatelic Society and the American Topical Association. The Space Units bimonthly official publication, The ASTROPHILE is furnished to its members in good standing. The publication carries articles of ongoing interest on United States and other countries space operations, lists covers and stamps issued on space themes, and provides a chronology of current and historical space events. Other regular features include auctions, classified and membership advertisements, Questions and Answer forum, and letters to the editor. There are frequent articles and information on obtaining autographs from astronauts and cosmonauts, and as well information on how to avoid problem areas of autograph and cover authenticity. The Space Unit encourages members to exhibit their collections at regional and national meetings. A range of medals--gold, silver and bronze, is provided at the national show, while a limited number of medals are available at other exhibitions. Information of preparation of exhibits are frequently given in the ASTROPHILE, and members can receive assistance and critique as desired. Members are encouraged to meet regionally, usually in connection with a scheduled philatelic event. Such meetings are regularly held in Chicago, Houston, and New York; periodically in Washington, DC and Detroit. An annual general membership meeting is held in conjunction with a national level exhibition. These have been historically located in a city which offers some space attractions. In 2001 the meeting was held in Washington, DC in conjunction with NAPEX 2001. In addition, meetings are held regularly for European Space Unit members. The 2001 meeting was held in Brussels in conjunction with Belgica 2001. Annual dues are $25 per year, and a $1 one-time initiation fee for new members. The ASTROPHILE is supplied as a benefit of membership, and is dispatch by third class mail. Overseas air mail is $25, in addition to the $25 annual dues.